As we drove to Queenstown, I had low expectations. Everything I’d read described the city as a place with any adventure for sale, which smacked of cheesy tours and amusement park rides. It has that, but in a setting of such honest, beautiful scenery, such that you fall in love anyhow. (It doesn’t hurt that they have a killer chocolate shop con churros y wifi, mighty tasty burgers, and the nicest hostel I’ve been to.) While posted in every shop window, the “adventures” weren’t blared in neon, nor pushed by money-grubbing touts. It was all quite civilized, and consequently…inviting. Elaine really wanted to do some sort of adventuring. Sarah didn’t. I was feeling ornery and noncommittal about joining Elaine, but then I had breakfast. Breakfast (food) somehow has this magical effect of making the world (and the Shotover Canyon Swing) seem so much more full of promise. Also, I did mention the burgers? 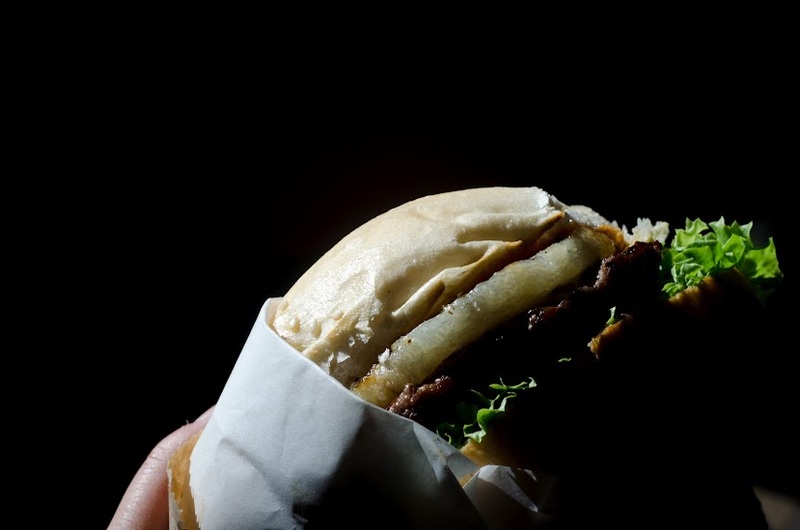 Let’s see some burger. 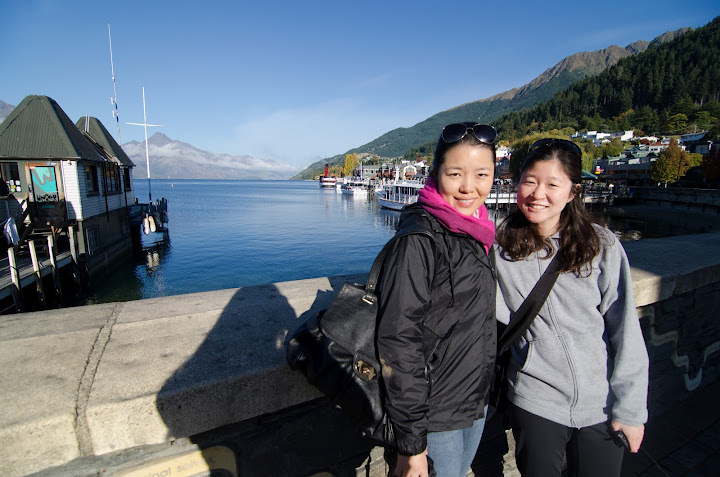 From Queenstown, it was off to our hike! The hike starts and ends from different spots, so we had it all planned out. We’d drive to the end, have a morning kayak, and then take a bus over in the afternoon to start the hike. 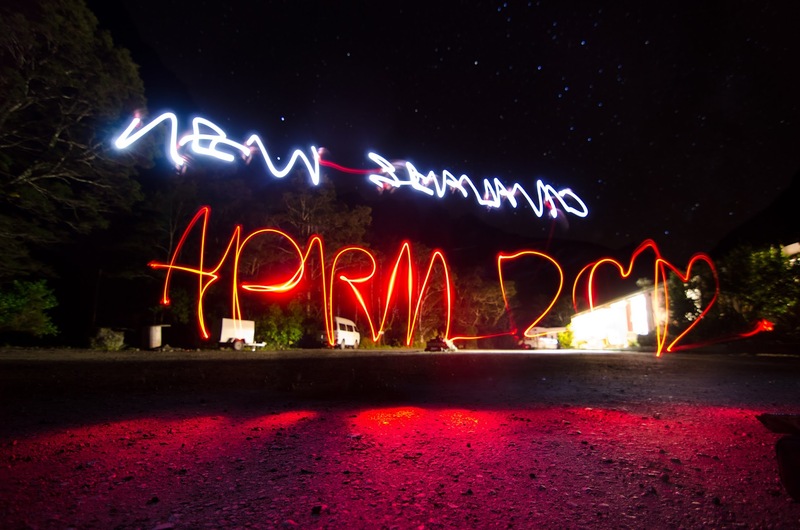 We spent the night at the lovely lodge, light painting silly things, and then we were off! N is a hard letter to write backwards. Also Z. The first day was an extremely easy warmup. Sunny afternoon, flat ground, short distance (5km). The ranger spent a long time telling us about nature. 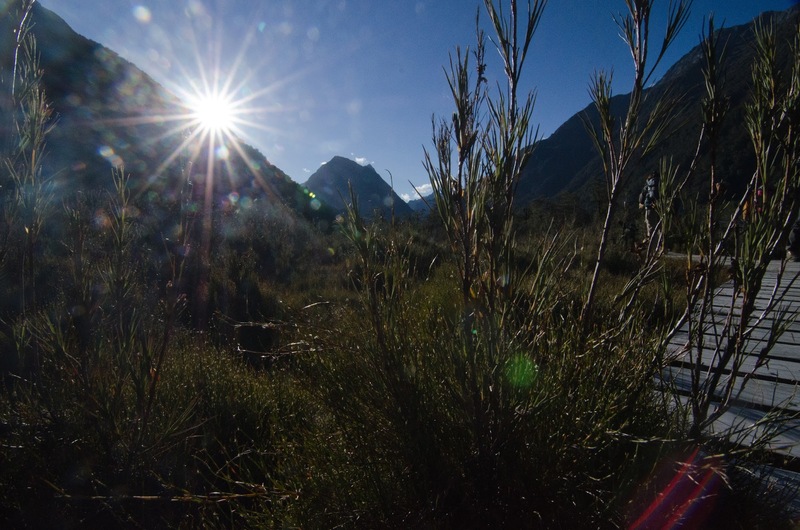 We went on an evening stroll during which we learned about manuka honey and how the local swampland cleaned things up. As dusk set in, we set out to find glowworms. 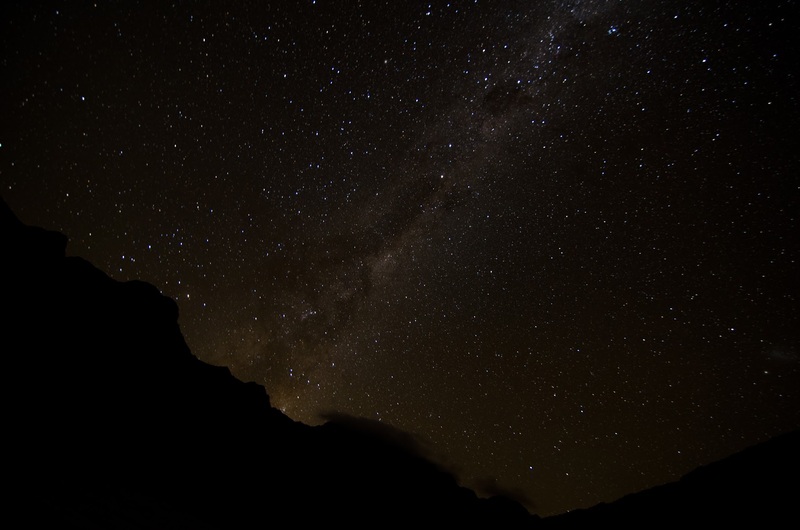 Since glowworms don’t like flashlights, we walked around in near darkness, getting brushed by twigs and shadows, which triggered certain scared women to hold my hand. Also of note: My alcohol stove worked! Although it turns out that the NZ hiking infrastructure is so good, they had actual gas lines in each of the huts we stayed at. Related, these “huts” were much more impressive than I had expected. I was thinking pit toilets and semi drafty wooden structures. Instead, I encountered solid buildings with some heating, running water (and toilets) and bunk beds with mattresses. Crazy. 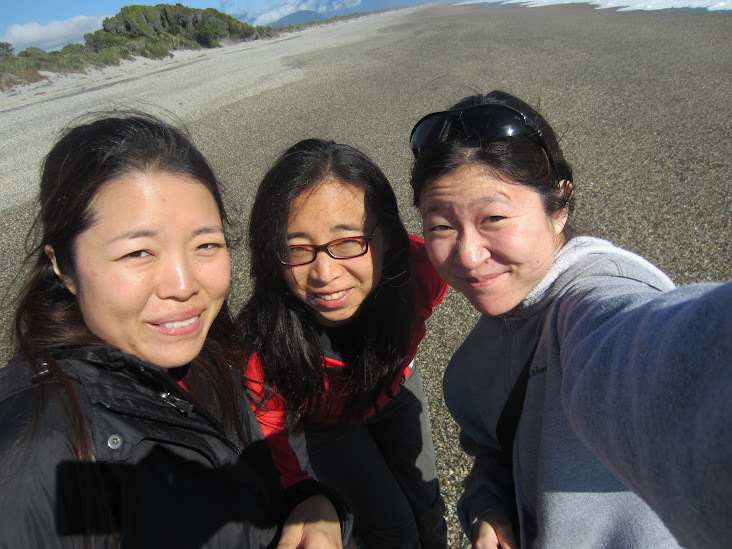 Some beach, between Bruce Bay and Haast. 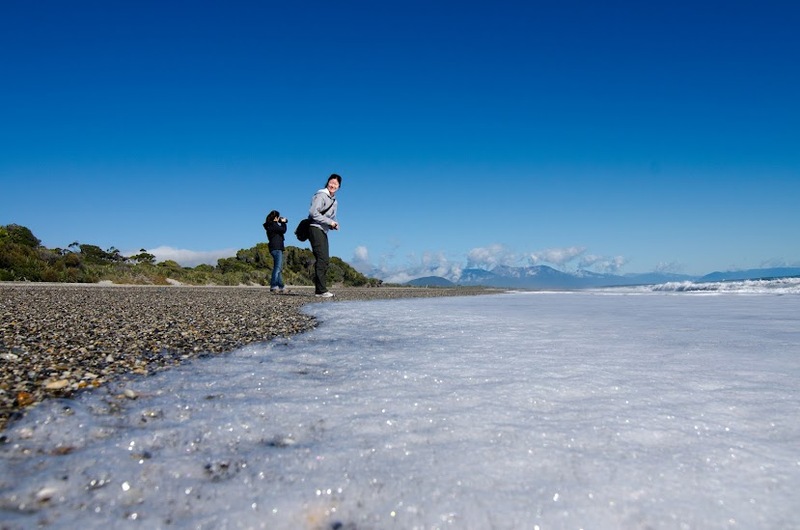 On April 17th, our 3rd day in New Zealand, we were beset by the scourge of that otherwise wondrous isle – the detestable Sandfly. We were on our way from Fox Glacier to Queenstown, the “Adventure Capital of the World.” I wasn’t very excited for Queenstown, imagining an activity-oriented version of Vegas, but in the meanwhile, the drive down route 6 (South Island’s western coast) proved an experience of its own. The little bloodsuckers completely ambushed us. With wide eyes, we took in the mountains, ocean, and forests (all the while nervously twitching about the left edge of the road). At some point, a rather attractive bit of ocean called to us for a stretch break. It had stacks and stacks of white stones, foamy waves, and fresh air. 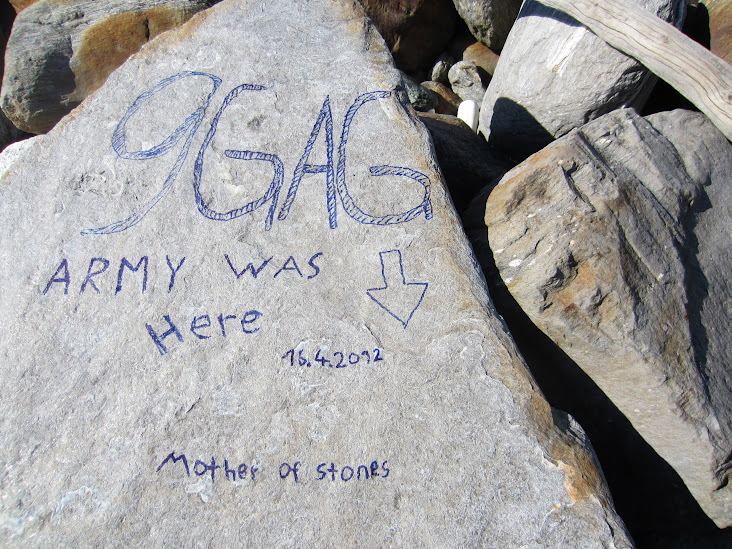 9gag was there the day before us! There were “I was here” rocks. There were chicken-soup message rocks. We had no markers, and no rocks, so we impotently appreciated the work of others. After some minutes, some gnats (so we thought) began to collect. This made us want to get back in the car and leave, which we did. We took a commemorative photo. You can see the grimaces, from the hovering “gnats.” Little did we know what was about to come. Elaine sprayed deet, someone opened windows, Sarah accelerated (maybe on the correct side of the road) and eventually 80kph wind blustered our attackers out. Some cleverly tucked themselves away to attack my sandaled feet approximately an hour later, but for the time being, we were safe. As we drove, my throat felt raw – whether from my recent plane ride, or from the DEET fumes, I wasn’t sure. I tried to breathe shallowly. By the time we pulled into the Adventure Queenstown hostel some hours later, I had 13 (yes, I counted) bug bites around my feet and ankles. And that was how I met the Sandfly.